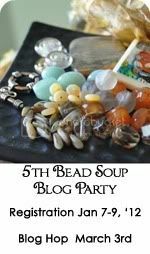 I started by gathering all the purple beads I could find from my stash. Since it was my favourite colour, I didn't have to look very far. The hard part was putting something together that actually looked nice and deciding which beads I should use. Should I use all of them or some of them. I decided to use the purplish-blue hue instead of the red-purple. Then it took me a couple weeks come up with the design. 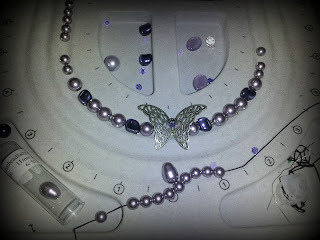 I had several butterfly filigree beads that I never used so I thought I'd include that into the mix. I used 2 sizes of mauve Swarovski pearls. 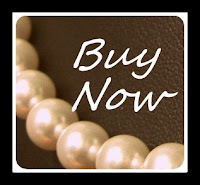 The larger 8mm pearls near the center/focal and the smaller 4mm pearls were handknotted for the rest of the necklace. I also used dark purple nugget shaped Swarovski pearls. I have never seen Swarovski pearls in this shape before until I saw them at a local bead store and just had to buy them. In the center, of the butterfly are two shades of purple Swarovski crystals with a teardrop Swarovski pearl hanging from the bottom of the butterfly. Here are the matching earrings. Both pieces are now on sale in my Etsy store. Just click on the button below. 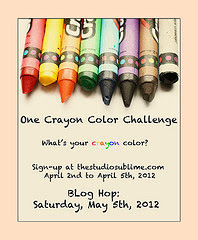 A big thank you to Sally Russick for hosting this challenge. 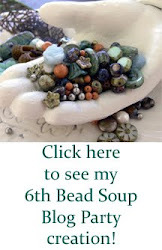 I learned a lot more about colours and jewellery design. Now, off to check out the rest of the participants! Fellow Sister of the Purple Hood... I love your butterfly necklace! So springy and light! I could totally see it on a line of bridesmaids at a wedding! Just beautiful! Hope your having a great time hopping! What a lovely, elegant piece! I just love the butterfly filligree focal. And the earrings are darling! Gorgeous necklace and all those pearls makes it even more special (I'm a bit partial to pearls!). Lovely!! This is a beautiful necklace. It is so soft and feminine. I love the soft shades that you used and the butterfly is very pretty. Great job! Oh wow I love your necklace it is gorgeous! 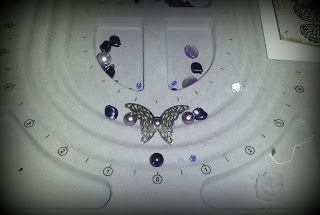 The different shades of purple came together so well and I love the silver filigree butterfly. Your earrings are very pretty too. That is so pretty! And I liked seeing your process. Very soft and feminine! I wasn't even aware that Swarovski made/sold pearls, I always think of them simply in terms of crystals, so that was interesting too. Thanks for sharing! I love the purple pearls!!!! Such a sweet necklace, and I really love the earring design! Tracy, what a lovely and elegant design! 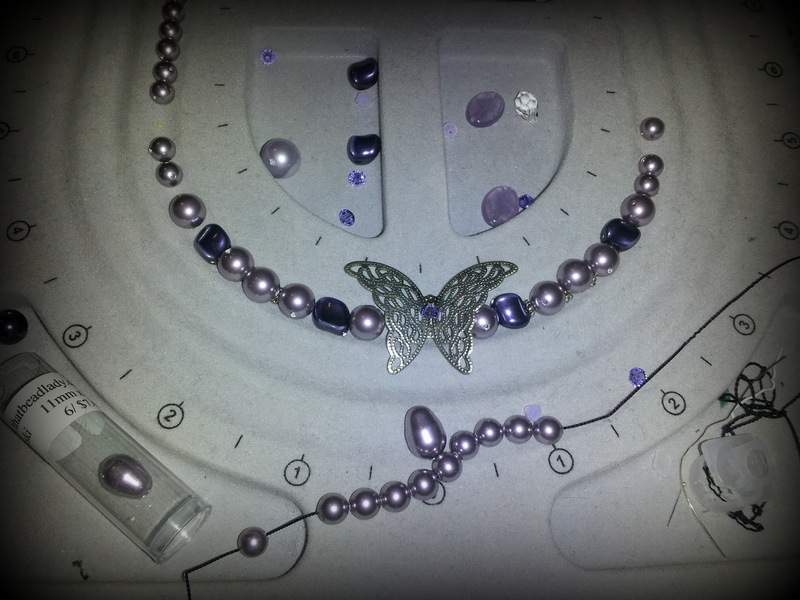 The purple pearls are fantastic and that beautiful butterfly draws your eyes right in!! GORGEOUS!! Love the earring too!!! Oh, and I don't think I've ever seen pearls shaped like that either, but I like them. Thank you for taking the time to participate in the crayon hop!! That is really gorgeous. I love all those purple pearls and I am a sucker for butterflies. The whole thing is just awesome. Simple but beautiful. I think it is awesome!! Very elegant. Thanks for giving us a tableside view into the process that went into your design! So elegant and feminine. Love the purple pearls and the focal. Very pretty - I'm a sucker for purple, too! I do love me some purple too and you really did a great job showcasing its beauty. I like how feminine your pieces are! I love how the darker odd shaped pearls add weight to the overall necklace but the butterfly filigree is really special! Beautiful! Gorgeous set - so delicate and feminine, love it! I love your necklace, love how you decorated the center of the butterfly! The pearls are lovely, I like the two shades you designed with. Nice job!